It all began simply enough. I had purchased an iPhone from Apple that was “unlocked” — and so, after almost 10 years with AT&T, I was moving to Verizon. At first, it was easy. Verizon said they’d use my iPhone X — tested it in the store — and I made the move. Three weeks of hell followed. Voice calls sounded terrible. Verizon said to talk to Apple because “it isn’t our phone; you didn’t buy it from us.” Meanwhile, Apple said, “Talk to Verizon. It’s a network problem." Calls and visits to the Verizon Store and Apple’s Genius Bar. Calls, escalations. Finally, an Apple senior advisor figured things out. It’s an unlocked Apple iPhone model # 1901. It’s a GSM phone. And Verizon is a CDMA network. So, in the world of techno doublespeak we now all live in, unlocked doesn’t mean “unlocked”; it means sort of unlocked. Verizon’s solution: I should sell my GSM iPhone, and they’d sell me a brand new Verizon iPhone, along with a two-year contract. It makes sense. Almost from the moment that Apple got out of the subsidized carrier phone business and began to sell directly to customers, there’s been a battle raging over who “owns” the customer. Apple wants customers to be able to shift seamlessly from any carrier. Verizon, AT&T, T-Mobile, and Sprint are all trying to find new ways to lock users in to their network, and device portability (or lack thereof) is the key. Now, stand by for a BIG new change. Currently, when you change carriers, you swap out your SIM Card. That’s an acronym for subscriber identity module, those tiny cards that tell your phone what network to seek out and connect with. But there’s new technology on the horizon that will make those cards a thing of the past. The physical SIM is being replaced by an electronic one, hence the “e” in eSIM. The eSIM allows users to switch networks almost instantly. If a particular network provides poor coverage in some areas, the user can switch to a different network with better coverage. The network is essentially made invisible — little more than a dumb pipe. Mobile providers hate this. But it's already available in iPads with the Apple SIM card. 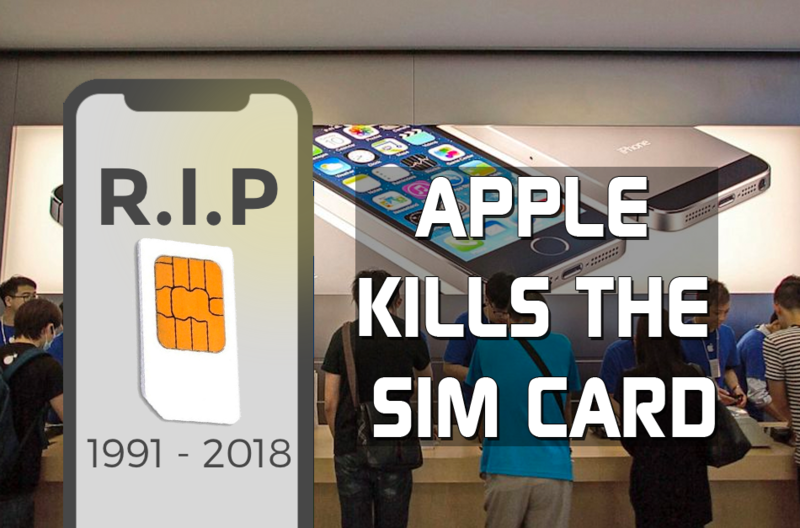 If Apple releases “unlocked” eSIMs on 2018 iPhone models as is expected, it loosens the control that mobile carriers currently have on customers. With the release of its Upgrade Program, Apple made it clear its 10-year-long love affair with carriers — in particular, AT&T — was over. By selling the phones directly, Apple owns the customer relationship. And by integrating the eSIM, the company takes the battle one step closer to all-out war. The rumors that Apple would at some point sell its own mobile service seem unlikely, given the high capital cost of building, maintaining, and upgrading network infrastructure. Instead, Apple is just making on-the-fly switching of networks a reality — which will create price competition in the market, particularly if the T-Mobile/Sprint merger closes as anticipated. So, cell phone users: Stand by. Changes are coming, and eSIM is going to make the hostage situation of past cellular contracts a thing of the past.